Village with 5,300 inhabitants halfway between Budapest and Gödöllő along M3 highway. In 1074 King Solomon was defeated here by Prince Saint László and Prince Géza, who founded here a votive monastery in commemoration of the battle. Both the Roman Catholic church (1784) and the Calvary (1770) were built in baroque style. The most recent sight of the village is the motoring race course called Hungaroring. 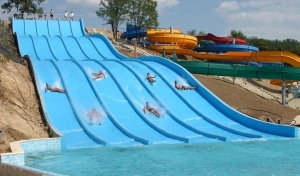 The 11,5ha Aquapark in beautiful surroundings is situated in the neighbourhood of Hungaroring. A view of the park can be seen from M3 highway, so visitors arriving here can see the chutes and other spectacular elements of the park from far away. Prominent program of the village is called Saint László Days (from June 20th till 28th). Viniculture and wine-growing of Mogyoród have a past of a few centuries: white and red wines grown in the cellars with fine must are worth tasting by all means.